Jindalee is an outer coastal suburb of Perth, Western Australia, located approximately 40 kilometres (25 mi) north of Perth's central business district. 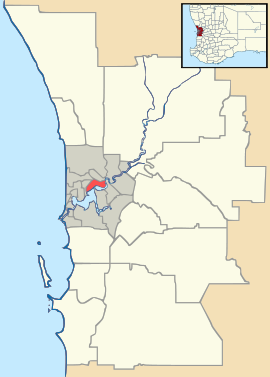 Its local government area is the City of Wanneroo. Jindalee is bounded by an east-west line near Eglinton Rocks to its north, Butler to the east (Marmion Avenue) and Quinns Rocks to the south (Hampshire Drive). West is the coast of the Indian Ocean. Approximately 75% of the suburb is still within its native state. The name Jindalee was proposed by the Shire of Wanneroo on 29 June 1979 and is an imported Aboriginal word from an unknown New South Wales dialect meaning "a bare hill", most likely referring to Eglinton Hill which is covered in low vegetation. The suburb of Jindalee in south-western Brisbane, applied in 1964, notes the same word origin. The planning of Jindalee goes back to 1997, but the Butler-Jindalee District Structure Plan was approved on 18 November 2003 by the WA Planning Commission. Satterley Property Group is managing the development (titled "Brighton Beachside") in conjunction with the Department of Housing and Works, and around 900 residential lots are proposed, all of which will have high-speed internet, cable TV and underground power. A small cafe/shopping node on the beachfront at the end of Jindalee Boulevard has yet to be approved. Approximately 15% of the lots have been developed and the projected completion date is 2010. Jindalee has no conventional facilities at the present stage, apart from a medical centre on Jindalee Boulevard and a fish and chips shop on the foreshore. Brighton Village Shopping Centre on the suburb's eastern border provides basic shopping needs, and Butler Primary School is nearby. Eglinton Hill provides views of the ocean and the scrub leading north towards Eglinton and Yanchep, and almost untouched beaches continuous almost to Yanchep are accessible by sand tracks. The undeveloped part of the suburb offers a wide array of native scrubland, woodland and heath, varying in condition from excellent to completely degraded, and including Xanthorrhoea preissii (commonly known as "black boys"), banksia, sheoak and Nuytsia floribunda. Some degradation has occurred due to uncontrolled vehicular access (especially the use of trail bikes), clearing for stock grazing, fire and rabbits. Jindalee had a nil population at the ABS 2001 census, but has seen rapid residential development in the latter half of the 2000s (decade). The 2011 population is estimated at approximately 1,274. Jindalee is served by a deviation of the 483 bus between Clarkson train station and Butler along Marmion Avenue. This service is operated by Transdev WA. Jindalee's political leanings are unclear as there were a negligible number of residents at the time of the last Federal and State elections. ^ Australian Bureau of Statistics (31 October 2012). "Jindalee (State Suburb)". 2011 Census QuickStats. Retrieved 16 February 2014. ^ Department of Land Information. StreetSmart Perth Street Directory (48 (2007) ed.). West Australian Newspapers Ltd. Maps 158–159. ^ Western Australian Land Information Authority. "History of metropolitan suburb names – J". Retrieved 2007-05-01. ^ "Jindalee (entry 41946)". Queensland Place Names. Queensland Government. Retrieved 13 September 2015. ^ "Perth Coastal Planning Strategy" (PDF). WA Planning Commission. 2005. Retrieved 20 September 2006. ^ "Brighton Beachside". Satterley Property Group. 2006. Archived from the original on 21 August 2006. Retrieved 29 September 2006. ^ Northern 78 timetable, Transperth, effective 29 April 2007. Accessed 1 May 2007.